Usenet, a few years ago, before message boards and web forums, “was” message boards and forums. Long ago (back in the early 90s! ), in the days before web browsers like we know them (with pictures, Flash games, embedded videos, etc. ), the Internet was text-only. You read your email with a program like Pan, and later basic text-only clients, and you browsed the web using software such as Gopher. Usenet clients were similar to today’s message boards in that you could post messages to them, and anyone who wanted to read them was able to. People could reply to messages so that everyone could read the reply (by simply posting a message to the same group), or email the individual poster. 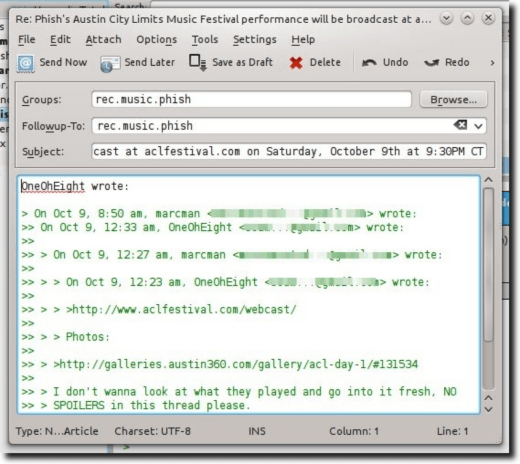 Eventually, Usenet became a hot spot for sharing files, and for spammers. Well, the messages are still there, although a great many of the once-popular groups have moved away from Usenet to more comfortable forums or message boards. But, Usenet is still there, is still useful, and in this article we’ll show a program for KDE Linux called KNode. 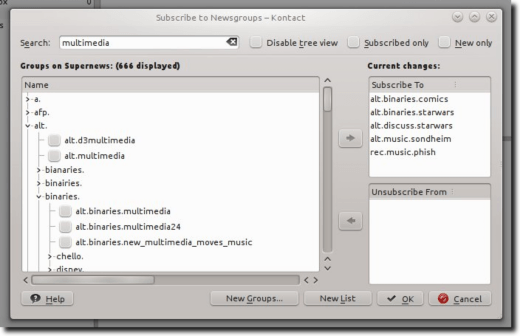 KNode is the default Usenet client for KDE. 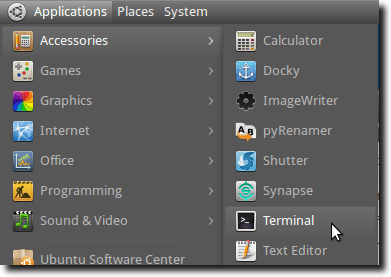 It’s part of the Kontact personal information manager (although probably not installed by default on many KDE-centric distributions), and can run either as a component of Kontact or as a standalone program. Installing it in Debian, Ubuntu, Kubuntu (or other Debian/Ubuntu based distributions), is a snap. First, call up your Terminal. Once downloaded and installed (if installing in GNOME, you’ll likely need a lot of KDE libraries along with KNode, but if already using KDE, the installation should be very short), KNode will appear in your Network or Internet section of your menu. Note: if you don’t use a Debian/Ubuntu derivative, you can get source code, and more information, at the official site, or by visiting here or here, for more information. On the left, where you’d normally have your inboxes and different email accounts, KNode has a list of different Usenet servers, and the groups you have subscribed to. To the right, where your new emails would be in an email client, is a list of all the messages in a particular group. Finally, below this is the preview pane, so you can focus on an individual message. Using newsgroups generally requires a paid account, although that’s mainly for people interested in downloading files. There are quite a few different options (free in many cases), for people only interested in reading and replying to posts, and not downloading anything. 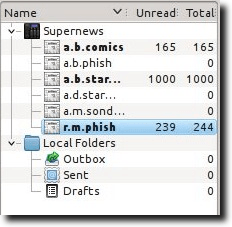 Note: as was mentioned earlier, Usenet is absolutely overrun with spammers. So it’s probably a good idea to use an email address that is ONLY for Usenet, if you plan on posting any messages. Once you’ve entered your account information for the Usenet server and your email information (necessary for posting anything), you’re ready to get started finding groups to subscribe to. You’ll first need to download a list of all the groups your Usenet provider carries, then search through them looking for topics of interest. You’ll find many groups which focus on sports, particular teams, movies, music, politics… pretty much anything you might find on a forum or message board can also be found on Usenet. Each time you start KNode, you’ll likely want it to search through those groups and download any articles that have been posted since you last looked. KNode can display those articles many different ways: by date, by title, by thread, by poster, by time, and more. Since you’ll quickly find that many posters add nothing to a conversation, you have the ability to filter them out. KNode has many powerful filtering options, so you can set your Usenet experience to be pretty much how you like. In this image, you’ll notice groups that have new messages are highlighted with bold text (in the left sidebar). Usenet isn’t just about files; it’s about communication, so you’ll likely want to reply to posts eventually. You can reply to the entire group, simply by using the “Followup To Newsgroup” option, or directly to the poster (assuming the poster entered a valid email address), with the “Reply By Email” option. Doing this is exactly the same as regular emailing (in fact, you probably entered in your regular SMTP address, if it wasn’t filled in already), especially when replying directly to someone, and should feel very familiar. While this is certainly doable, it’s not a lot of fun, especially when trying to download a single disk image (of a Linux distribution, for example), that is hundreds of megabytes and perhaps thousands of tiny messages. Trust me, you don’t want to assemble that by hand. Better to use a NZB client that downloads and assembles automatically, or a traditional method like HTTP or BitTorrent downloading. 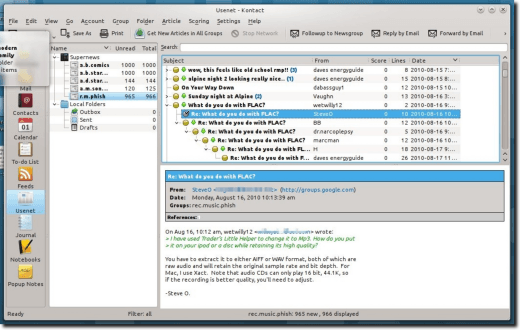 KNode excels as a Usenet reader, and that’s good enough. It’s fast to load, fast to update, and has nice features like filters, searching and scoring of articles, to help you see what you want. You can use multiple accouts with KNode, archive messages, follow individual threads, and even use it to read mailing lists (via the Gmane mailing list archive). KNode is a great program, and for those of us who are still a bit nostalgic for “days gone by,” disregarding the fact that it’s a really useful program, it’s also worth a quick download and install, if for no other reason than to remember the Internet like it used to be.